Now that in my other article I gushed a bit over vital records in the UK, let's shift our attention to the UK Census - another wonderful tool for those researching British ancestry! For over 200 years the UK census has been a vital tool for guiding public policy. To learn more about its origins, how the information was collected, the history and usage, read this informative and yet short discourse titled "200 Years of the Census." The best and unplanned "side benefit" of this decennial enumeration of those inhabiting the UK is the wonderful information that it provides to genealogists and others researching family history! Every 10 years we are able to "see" a snapshot of a family and its members, the neighborhood, community and more. We see new family members added, others who are lost, changing occupations, movement from one place to another, etc. What would you give to have census records that tell you what "parish" your ancestors were born in? How about if that was true starting in 1841? What if there was no lost 1891 census? Welcome to the world of UK census records. Though, do recognize that these countries do impose a 100 year moratorium on releasing census information to the public with some exceptions. So, where in the US we can see census records up through 1930 and request information from the 1940 census, in England, Wales, Scotland and Ireland, 1911 are the most modern records that can be consulted. Not only for England, Wales and Scotland (Ireland is a different story) do these census records survive from 1841 to the present, these records include information that one doesn't not find in the US census. Where birth places for our ancestors are identified by birth state or country, these census records typically state the parish or town and the county of birth. This means no "guessing" where in Lancashire an ancestor came from - the census will reveal whether it was Oldham, Hollingwood, Chadderton, etc. First, check out the companion project to FreeBMD and FreeReg (discussed in the companion article on UK vital records), which is FreeCen. This project is a little different in that it includes Scotland as well as England and Wales. 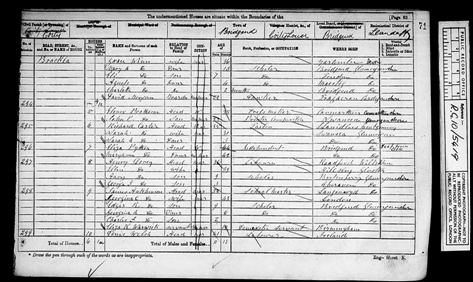 For years, the 1881 Census has been available via Family Search. The more recently released 1901 Census is available via a dedicated web-site, http://www.1901censusonline.com/ where you can search for free and pay-per-view to see results. The 1911 census has just been released to the public with some information masked for privacy (though not all information will become available until 1912). You can search for free though you have to pay-to-view any found records. Realize that there are several other sources for the census records of England and Wales, including several commercial ventures which are not listed. Didn't find what you were looking for via the above suggestions? Check out the web-site Census Finder; it contains a fairly comprehensive list of what census records are available online for England and Wales, as well as Scotland and Ireland. The list includes not only national census records, links, and census substitute records, but also localized census abstract databases. Besides the FreeCen project already discussed ScotlandsPeople, which is a partnership between the General Register Office for Scotland, the National Archives of Scotland, et al and is the official online source of parish register, civil registration, census and wills & testaments records for Scotland. This web-site makes census records of Scotland from 1841, 1851, 1861, 1871, 1881, 1891 & 1901 available for a fee. Also reference the web-site Census Finder. Unlike English, Welsh and Scottish censuses which are available for much of the 1800s, Ireland's history is a bit different. The first full government census of Ireland was taken in 1821 with further censuses at ten-year intervals from 1831 through to 1911. No census was taken in 1921, because of the War of Independence. 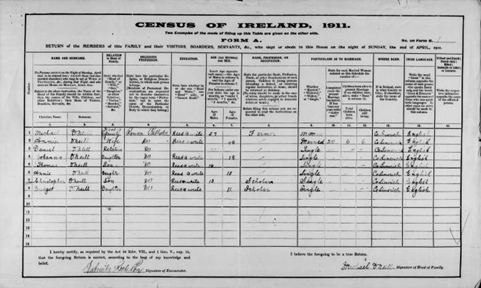 The first census of the population of the Irish Free State was taken in 1926. At this point, I'm sure that you are thinking that this sounds wonderful and how could there be any problem. Well, the problem is that the census returns for 1861 & 1871 were destroyed shortly after the censuses were taken, those for 1881 & 1891 were pulped during WWI and the returns for 1821, 1831, 1841 and 1851 were, apart from a few survivals, destroyed in 1922 in the fire at the Public Record Office at the beginning of the Civil War. The first surviving census is for 1901. So, unlike for the US and most of the UK, Ireland does not have any surviving country-wide 19th century census records. Fortunately, recent access has been granted to the 1911 census. To learn what other surviving census records are available online, check out Joe Beine's website and Census Finder. By no means is this article exhaustive about UK census records, their history, what is available, or how to acquire them! Part of this is because there is so much material available and more and more digitized material is becoming available every day--especially from ongoing projects such as FreeCen. Do try and "cross the pond" in search of your UK ancestors. Other than some vernacular, you mostly deal with a familiar language, English, and you will find that UK census records aren't that much different from what you are familiar with in the US. The exceptions are that they contain more detailed birth place information and survive for 1891! If you are reading this article, you are already someplace where you can search the UK census records! 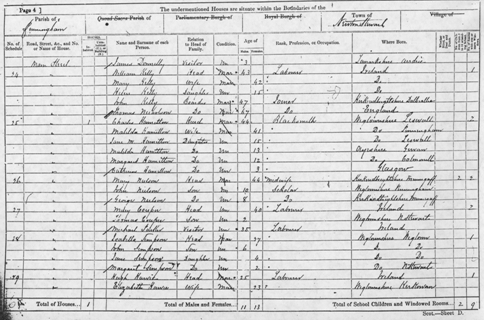 Membership to this web-site gives you access to the 1841-1901 census transcripts for England and Wales. All transcripts are complete, except for 1881. Search this database to find: name, birth year, birth county, profession, relation to head of household. An example of the 1871 Welsh Census - note that birth places list town county! 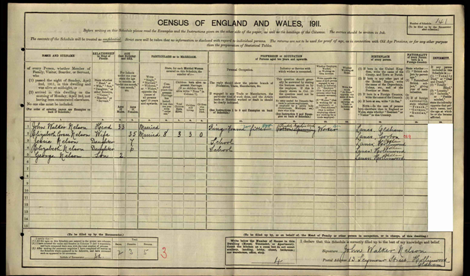 An example of the 1911 England and Wales Census - the original "census" forms filled out by the family members were retained (where for previous censuses they were destroyed) which gives you the hand-writing and signature of the head of household.